Today, I have a guest posts from my dear friend Sharyn. 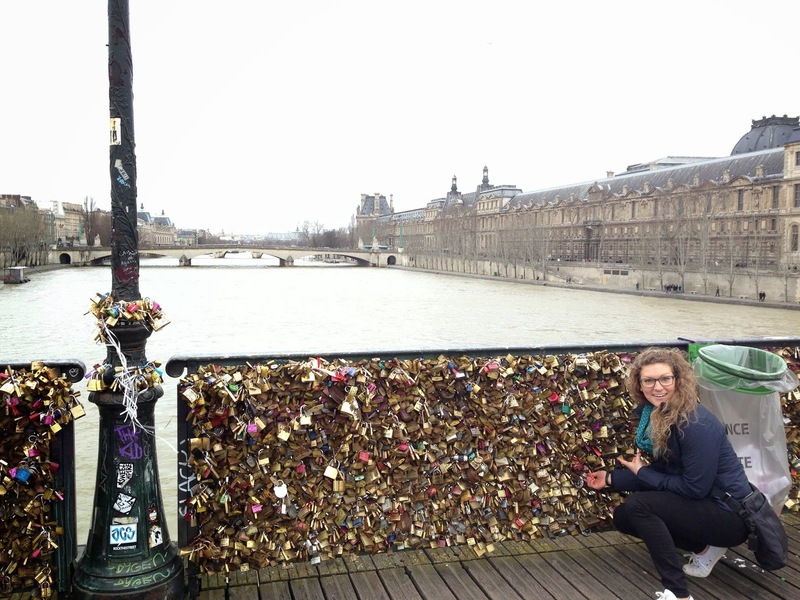 Sharyn was lucky enough to go to Paris with her fiancé (now husband!) about a month before their wedding when he had to go for work. Lucky girl! Sharyn is a dietitian and has one of most wonderful outlooks on life & health! You should also probably know that the first time Sharyn went to Paris was with ME, over 7 years ago (with the best Parisian tour guide ever, my wonderful friend, Antonio!). Us at Versailles. I carried around 3 loaves of bread and didn't eat ANY of them! Most self control I've ever had or am likely to have again. Also, ignore our clothes. Here's here recent travel journal & series of anecdotes. She gives great tips on an Amelie experience as well as how to eat healthy in the city! She's one of my favorite people and also one of my favorite story tellers. You can read more of here blog, here. I hope you enjoy! Because 7 years ago I was seeing the city of love for a weekend… with a love… but not in the romantic sense (no offense Nae Nae)… you see, 7 years ago I saw Paris for a 48 hour whirlwind trip at the start of a 10 day journey around the world wherever RyanAir would take me with one of the best adventure/travel partners a person could ask for: Renee “Nae Nae” (then) Cutaia (now) Olson. My first trip to Paris was unforgettable. And now, given a second chance to explore what became one of my favorite cities, I was elated to plan – in a similar manner- my plan of attack. Having recently viewed Amelie and Julie&Julia for inspiration, I grabbed my well worn MTV Europe book (our favorite guide book) that led me through so many historical and cultural sites back in 2007 and flipped to the Paris city section to see my highlights and notes from our previous adventures. Since I had been to the main sites (Arc d’Triomphe, Eiffel Tower, Musee d’Lourve, Notre Dame, etc etc) before, I didn’t feel the pressure to spend time planning trips to that area of town (sort of central Paris). Instead I “Bing”ed (I say that since my husband works for Microsoft, even though we all know which search engine I probably used) the phrase “walking tours of Amelie film locations” and found one that mentioned all the places I had noted from my recent Paris themed movie weekend and began plotting. The one area of Paris I had yet to see, since it was a little farther away from the City Center tour we took during my last trip, was Montmarte. 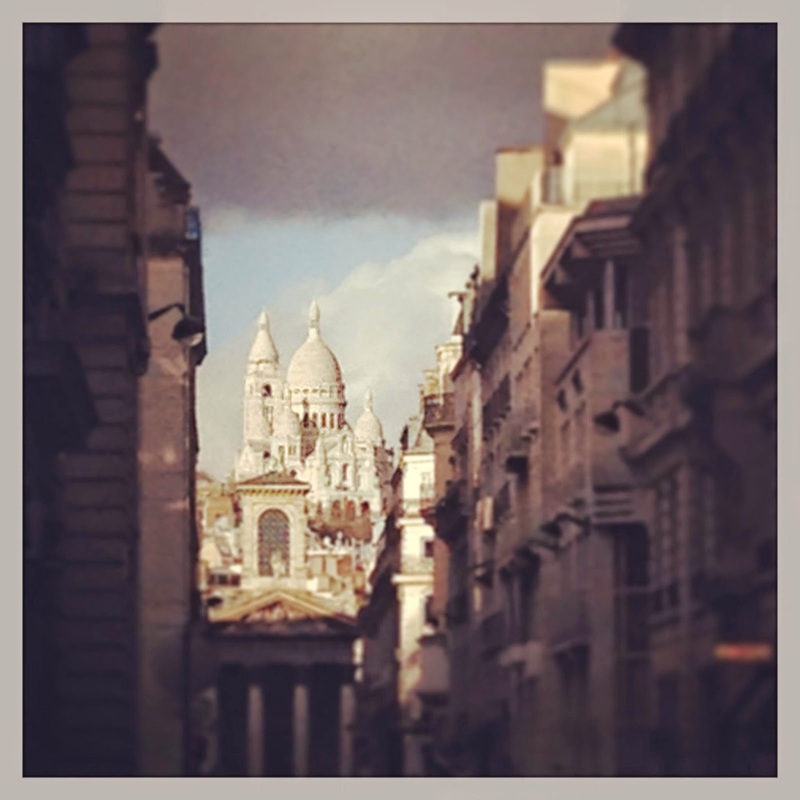 Known for its idealic hilltop neighborhoods (reminded me a little bit of San Fran) and of course, the white washed stone cathedral that can be seen throughout the city landscape: Sacre Coeur. That was number one on my list and since I had more time to really take it all in I felt it might be nice to meander up some side streets, poke in some local grocers and get some snacks, and sit in a café to slowly sip some “expresso” (as the signs read at many of the cafes) with a delightfully buttery/flaky croissant, rather than going directly there and back. I will add that I had forgotten how little the French eat since they all smoke and caffeinate their appetites away (slight generalization…) so while I was famished and ready for a big breakfast, there was nothing but coffee and croissants to be found. Not that I will ever turn down a good croissant, I’m just saying, this body shuts down without some kind of color at every meal. So as I was wandering from place to place, both reading menus searching for anything more than carbs and caffeine, and working up the courage to use some of the tiny bit of French I had rehearsed with Bryan (who has had 5 years of French in his background) – I remembered passing a little natural foods eatery that I prayed was open for breakfast, and sure enough! It was. So to Ekki Natural Foods I went. Grabbed a premade arugala, mixed veggie, lentils and poached egg mix and an Americano (ironic that they serve those in France? Maybe, but it was delightful). SO for all of you out there who complain that there is no way to eat healthy when traveling, I’d like to dispel those beliefs little by little. You just have to make it “non-negotiable” and make sure you keep an eye out while you’re walking about enjoying the scenery for restuarants /eateries that serve fresh foods. I will say, it helps to notice what people are eating on the street as your walking. I first noticed Ekki the day before when I saw someone walking around with a green smoothie. Upon staring at this stranger for probably an awkward amount of time thinking “where in the world did they get that? I want one.” I noticed the Orange and Green lettering on the cup. Which leads me to another rpoint: typically natural or vegetarian friendly restaraunts are labelled using “earthy” colors… orange/green/brown/yellows. Etc. 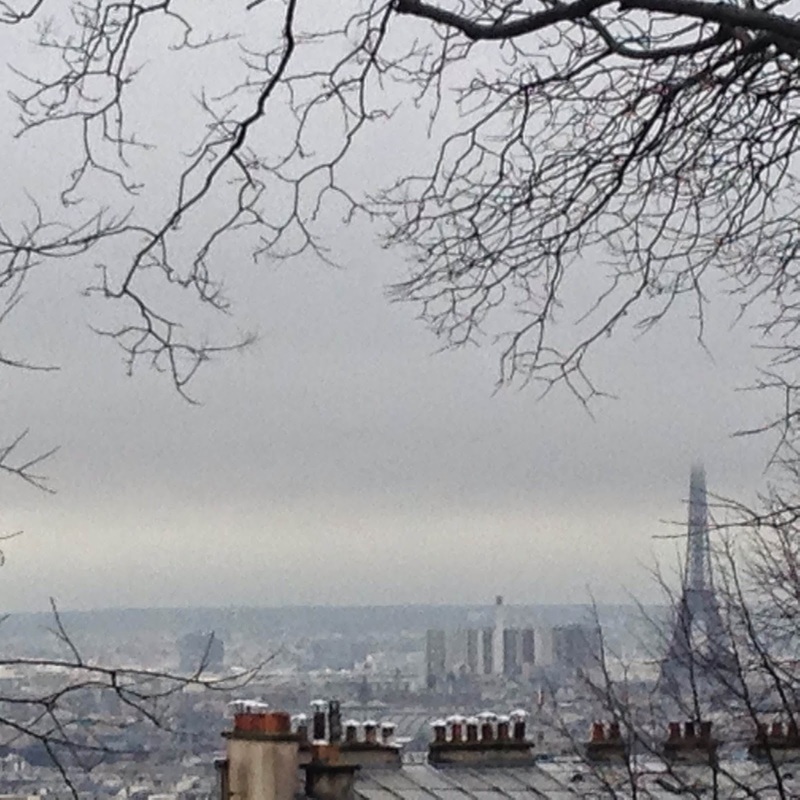 Ok, so fast forward, I am now wandering up towards Montmarte via the map from the hotel lobby . Stopping for fruit at a market, people watching (and listening as I love the French language) . taking in the sites and every now and then turning around to see the view from where I’ve come. It’s magnificent and though the roads are becoming steeper and sidewalks are turning into stairs, I am getting more and more excited as I recall my mantra from 2007 trips around the world was always “there is yet to be a view from the top that disappoints me” so up I go, taking note of Amelie film spots and cute little areas I could picture myself living until I made it to the top, seeing cobblestone streets, narrow alleys, tons of street artists and vendors with art exploding out of their doors. After touring the cathedral I wandered around the little town of Montmarte, had some expressso and a chocolate croissant, and then headed back to meet Bryan and change for dinner. The rest of the Paris trip was all the typical spots revisited and seen in a new refreshing light as love tends to do to people and places. For instance, I don’t remember walking across the Pont Des Arts (love lock bridge) 7 years ago, but now, it will forever hold a place in my heart- no matter how cheesey or cliché it may be- as Bryan and I “locked down” that love and threw the key in the river, as you do. Not being much of a “museum person” myself, Bryan really wanted to go to at least one while we were here so I suggested the Musee d’Orsay as it was one I hadn’t seen yet. 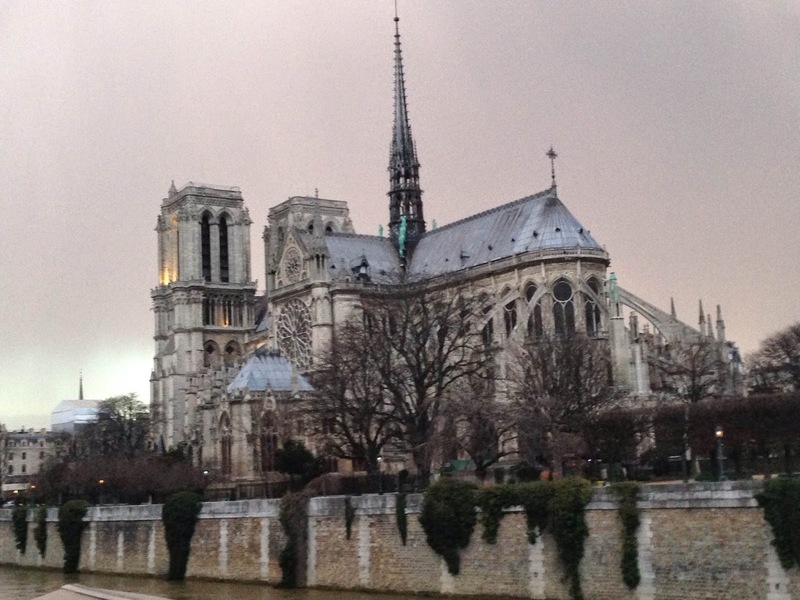 We were able to get in and out in about 1 ½ hours (little to no wait to get in on a Sunday afternoon after a church service at Notre Dame). We didn’t plan our weekend out methodically so we didn’t invest in the “Paris Pass” or any other discounts but I did research a lot of ways to save money in Paris if one wanted to. Since we mostly just walked around and looked at free things we figured we could shell out the money to go to one real museum and just call it a donation to preserving the art and culture of Paris. Dinners! Dinners in Paris were a fantastic cultural experience. We had to keep telling that to our wallets as well since they kept complaining about how skinny they were becoming while we were being filled with amazing tastes from butter. Baguettes. Bordeauxs and you might be surprised at how many vegetables and vegetarian options we were able to find. While we dined a fine places such as L’Tour de Argent (specatular view, uppity French cuisine atmosphere and tiny portions for enormous prices – a once in a lifetime experience… as in we can only afford to do it once unless we want to dip into our retirement funds), and a dinner boat cruise along the River Seine- lovely sights from the river and again, very good vegetarian options… BUT my personal favorite dining (aside from the boloungeries that you pass every other block wafting smells of fresh baked goods into your nostrils and heart) was the falafel stand called Mazo (MTV EuropeParis Eats section FOR THE WIN) in the heart of little middle east (not sure if that’s really what it’s called but there were probably 2 dozen falafel/gyro places and tons of shopes/souvies similar to middle east. Therefore, we dubbed it so.) Mazo falafel is fantastic BECAUSE. It is affordable. And they load your falafel pita with 5 fresh little balls of garbanzo bean love and then give you access to the incredible edible bar of delightful toppings that range from pickled peppers and veggies to various flavor and spice sauces, relishes, sun dried tomatoes, olives, feta cheese, and so many other things I’ve forgotten but let’s just say, I topped off my falafel, ate half of it, and then went back and topped it again. It’s like two meals for the price of one! Thus again, dispelling the belief that one cannot eat well (healthy and cheap) in Paris. Tis NOT true! Just seek and ye shall find. Now having bored you to death with details that may or may not apply or interest you, I release you. Plan . travel. Adventure. Whether it’s in your own city or across the world. Never underestimate the availability of free things. And when in doubt, share a bottle of wine and a baguette with someone you love.